There were several vendors offering extraterrestrial life forms for sale. I don't know if these were legitimately acquired or poached illegally, but surely the Flower and Garden Show Space Alien Regulatory Committee looks after the interests of vulnerable backwater planets, at least when sustainability is the theme. 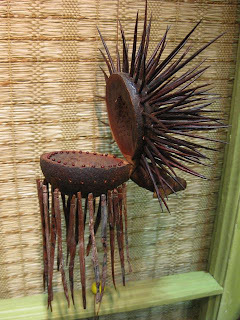 This strange creature, which its vendor called a "Wind Chime," was a little spiky, I thought, to be a good indoor pet. Its vendor suggested that it be kept outdoors and hung by a string, which struck me as a little cruel. Another species for sale--a round, wooly little creature called a "Snooter-doot"--seemed much better suited to indoor pethood. Yet looks can be deceiving! Many of them were cunning enough to have escaped, and had gone native among the display gardens.